Accessible media is crucial for students with disabilities, but it can also provide tremendous benefits for all students. 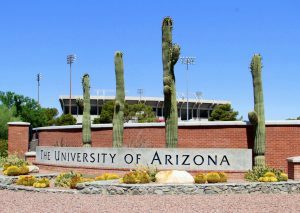 The University of Arizona has an agreement in place with AST to provide captioning services at special pricing for all University of Arizona member organizations. Making media accessible is an obligation of all media producers, but it can be a challenge. CaptionSync stands out for its quality, simplicity, and top-notch support. Users can quickly and easily submit their media online and have captions returned directly to your video system. If you have a transcript already, we can create the caption files in a matter of minutes. If not, we will create the transcript for you using our trained transcribers (no error-ridden automated speech recognition transcripts!). Step 1: If do not yet have a CaptionSync login, complete our account setup form. Please use “uarizona” in the Reference Code field when completing the form. You will get an email back from our support folks with your account credentials. Step 2: If you are new to CaptionSync, watch our New Users Tutorial to see how it all works. Step 3: Once you have a CaptionSync login ID, proceed to the login page to access your account. Once you submit your media file(s), the results will be emailed back to you as soon as they are complete. AST was founded in 2003. Our longevity is a direct result of our dedication to service and to the success of our clients. Today, CaptionSync has over 6000 users, including many names you will recognize, like the Library of Congress, NASA, the State University of New York (SUNY) system, and Rochester Institute of Technology (RIT). Quality: CaptionSync uses trained professional transcribers to generate our transcripts — not speech recognition! To learn about the perils of using speech recognition, see our research page. Service: Our success is dependent on your success — so we do everything we can to ensure your success. Simplicity: Using CaptionSync requires no special software or skills — just submit your media via our website and wait for the results. Integration: CaptionSync is already integrated with a number of lecture capture systems. If you wish to integrate CaptionSync into your own automated workflow, we offer a simple interface that makes this a breeze. Output types: CaptionSync produces over 100 different output types to support a broad range of players and media types. If you don’t see what you need, just give us a call. Redo: CaptionSync offers a redo feature that allows you to make changes to your transcript, changes to the captioning options, or to select alternate output types — all for no cost. Expertise: AST has been providing video accessibility services to higher education since 2004. Our dedicated efforts in captioning technologies and our long history with educational institutions gives us an edge. Our expertise is reflected in our product and much of it is shared in our tutorials. Environmentally Sound: AST prides itself on being sustainable and environmentally conscious. Our electronic job submission system means that no physical shipping of media is needed. Our results are all returned electronically as well. Our invoicing system is all electronic. And, while you are welcome to pay us by mailing checks, AST also accepts Electronic Funds Transfers and online credit card payments. One of our webinars provides information about CaptionSync’s bulk captioning submission tools. If you need additional information, pricing, or help getting started, please contact us. Visit our archive of tutorials on how to use CaptionSync, and on captioning topics in general. To see what types of media you can submit to us, visit our list of acceptable media formats for submission. If you need to submit physical media (DVDs or VHS tapes), contact us for more information. To see a list of caption file types you can get back from us, visit our list of output types. If you have a technical support issue, please complete a support request. Not with a University of Arizona member organization? If you are not with a University of Arizona member organization and are interested in making your own system-wide arrangements with AST, please contact us to discuss.